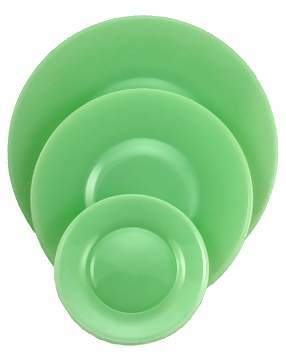 Nicole Pattern Salad, Lunch or Dinner Plates in Jade or Jadeite (Milk Green) Glass: Sold individually - the smaller plates measure 6 inches in diameter. The luncheon plates measure 8 inches in diameter and the dinner plates measure 10 1/2 inches in diameter. Each of the plates are hand made, hand pressed and hand finished in the USA in Ruby Red glass. These plates are made by hand and they are made to order. The typical lead time on these plates (from the date of order) is about three weeks.